The national exhibition of FCPR took place at the same time, and Bucharest, the capital of Romania, was chosen as the host city for this big event. It was a well-organised event, as you can tell from the pictures. Big open spaces, and a lot of natural light. 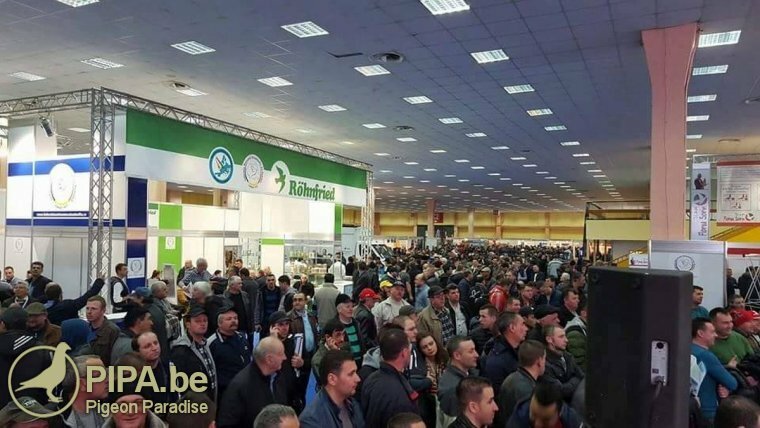 In the products section, among the different Romanian champions, we found the stands of some of the big names from western Europe: the Eijerkamp family, Vanhee, Emiel Denis, the Herbots family, Jef Vanwinkel, Yves van der Poel, Kipp & Sons etc. Many of the important companies for pigeon supplies were there as well: Geraldy, Roehnfried, Versele-Laga, Bricon, Benzing etc. Among the visitors without a stand we met some great champions and friends of Romanian fanciers, including Eric Limbourg, Nicolas Norman, Jean-Marie Colson or Eros Carboni from Italy. One of the most important guests was the Chinese delegation, with most notably the president of the Chinese Racing Pigeon Federation, Mr.Xiao Xiaoquan! Visitors could admire many original documents (a treat for the collectors) dating back from 1930-'40, from the legendary Dr. Arthur Bricoux and military Major Traian Nitescu. He imported a historic group of pigeons from Dr. Bricoux in 1938, and he is considered the godfather of pigeon racing in Romania. Some of the original pedigrees of these Brioux pigeons and all original ring cards were on display as well. The introduction of pigeons from another legendary fancier, Jozef Morh from Aachen-Germany, was also documented in detail. On the celebration gala the guests were introduced to some traditional Romanian dances, as well as some traditional Romanian music. PIPA and its agent Dr. Dinu Mihai arranged a number of loft visits for Erik Limbourg and the Eijerkamp family, as well a a culinary tour in which the guests got to know the Romanian culture and people. We reckon everybody would like to have another taste of our "mici" and "palinca". The Romanian fanciers are looking forward to the next important event that they get to organize. Romania is an amazing country and a very large country with many different landscapes and the amazing Delta Danube. Every new event could be an entirely new experience for our guests. We thank the F.C.I committee for giving Romania the chance to organise this beautiful event. I have only one question. I could't find in the article any results of the competition. Thank you in advance.